This is the fourth installment of our fantasy portfolio series blog posts, in which we build a fantasy portfolio from scratch and track it over time. (Check out the intro, our discussion of yield versus growth, and ourdiscussion of dividend safety.) We decided to build a dividend growers portfolio, and in this post, we’re going to start looking for stocks. We’re going to base our screener off of the Dividend Growers screener (available in the library), but we’re going to add some modifications. The Dividend Growers screener is a ranked screener, which means that it will not only show a list of stocks that pass the criteria, but it will rank them according to which stocks pass with the highest marks. While ranked screeners are a Premium feature, Basic users can still run the screener without the ranking weights—this means that they can get all the stocks that pass the criteria, but they won’t be ranked. Because we’re looking for dividend growers, we want to limit the yield (remember high yielders probably won’t have room to grow their dividend much more) so we’ll cap it at 5%. But, we still want the yield greater than 1% because still want some current income as we wait for dividend growth to occur. Here we’re selecting for stocks that have shown strong, consistent dividend growth of over 5% in the past five years. This ensures 5 years of solid earnings growth. Later on, we’ll take a closer look later at the earnings of any stocks that we let into our portfolio, but this acts as a blunt first cut. 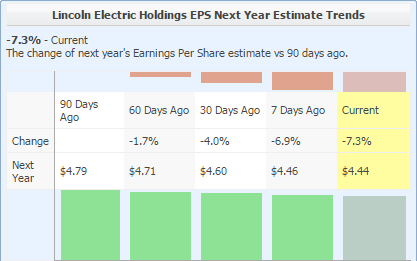 If you look at the bottom of the Insight panel’s summary tab in the &ldquoGrowth section“ (when any stock is selected), you’ll see that the EPS 5-year growth rate for the S&P 500 is actually around 12%, so this criteria is really a safeguard against stocks with slower-than-average earnings growth. We only want to look at mid-cap stocks or above. Not only are they less risky than small caps (in general), but they also are more likely to have analyst estimates, which we’ll use to see how the analysts are thinking about the stock. We’ll take a closer look at operating income of all the stocks later, but to start we’ll use this broad criteria that knocks out any stocks that haven’t grown their operating income more than 6% a year over the last five years. Similar to the EPS growth rate, you’ll see in the Growth section of the Insight panel’s Summary tab that the S&P 500’s average value for this metric is 7.9%, so it really only knocks out stocks with slower than average growth in operating income. As we discussed in our dividend safety post, the Payout Ratio should be compared against those of peers stocks, and against the stocks own average. However, 50% is the generally accepted baseline of a healthy amount of earnings to devote to dividends, regardless of the industry. There are some industries or stocks that can comfortably pay out more, but for the purposes of this screener we have to draw the line somewhere. This is another broad stroke that knocks out companies that weren’t able to grow their earnings at least 3% for the past five years. We will dive deeper into the sales numbers for any stock before we let it into our portfolio. We’ve kept it low, around 3%, in order to let in some banks, which typically have slow sales growth but are strong dividend growers. Again, the Insight panel tells us that the S&P 500 average for this metric is 2.6%, so this will screen for stocks with slightly above-average sales growth. Each stock that passes the screener will be scored using these weights and given its ranking. This lets us see which stocks that pass did so with the “highest marks” so to speak. We’ve set our screener to return the 100 highest-ranking stocks. This may seem like a lot to handle, but we’re going to use Stock Rover to quickly sort them into stocks that we want to take a closer look at, and stocks that we’ll discard. Developing a system lets us weed out unimportant information and not get overwhelmed. I also want to stress that not every stock that passes this screener would be a good investment, and by the same token, not every dividend grower worthy of investment has passed this screener. If you are concerned about missing out, you can always iterate the screener with a few tweaks to see if you let in any other potential winners. For our purposes, one pass with a well-developed screener is all we need to get to a handful of really strong performing stocks. Below, you can see the list of the stocks that passed along with the rank. 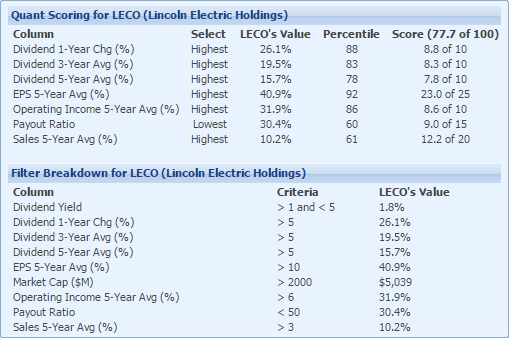 If you have a Premium account and run this screener, you can mouseover that number in the rank column to get the breakdown of how the stock did in every criteria. 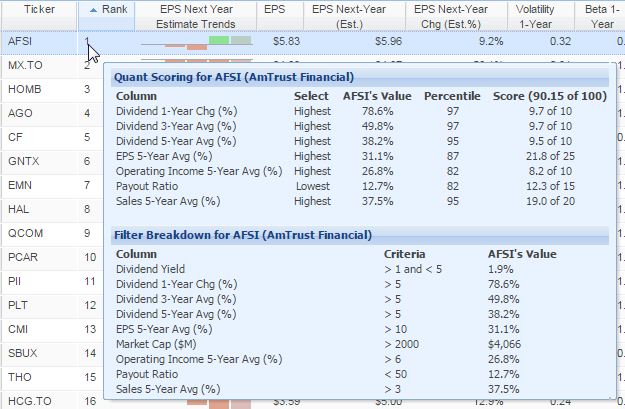 For example, if we mouseover the “1” next to AFSI, we can see why this was the number one ranked stock. It has really strong numbers across the board, achieving a 90.15 out of a possible 100 based on its percentile rank of the ranking criteria. Before going any further, first I’m going to save these results as a watchlist so that I can “freeze” them, meaning I can always return to this same set of stocks (to download this watchlist, head to the library. 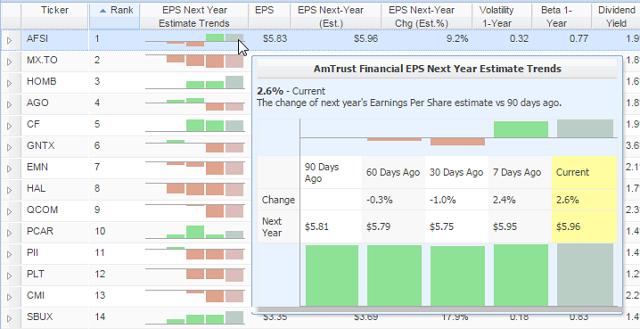 Saving them as a watchlist means that I can remove stocks that don’t pass further tests. Now we’ll run through a process to quickly pare this list down. There is a near-infinite number of ways to proceed from here, and I’m going to simply go through one method that I like because it communicates a lot of information about a stock in a short amount of time. I will have to make some decisions about which information I’m going to prioritize, as well as apply objective criteria that may cut out some worthy stocks with extenuating circumstances. Until we can get down to a smaller number of stocks to which we can apply some more subjective analysis, we’ll have to rely on objective measures. Custom View: I’m going to make my own view (just called Dividend Growers View) with all of the metrics that I care about, at least for this first pass (namely EPS Next Year Estimate Trends, Volatility, Beta, and Dividend growth rates) so I can see these in the Table. I’ve set up the chart to look at a 5-year period with the stock charted against both its industry and its sector, so I can see not only its price performance, but also how it’s done against its peers. I’ve added in splits too, which can sometimes help explain a change in the chart’s pattern. I’ll also add in a metric package that will chart the Sales, EPS, and Operating Income over the past five years, so I can keep an eye on how those have been doing. Please note that metric packages are a Premium feature. Insight panel’s Summary tab: I’ll keep the Insight panel visible, because it shows a quick description of the company so I can get a sense for what it does, as well as how the stock’s growth in Sales, Operating Income, and EPS have done against its industry and the S&P 500 over the one, three, and five year periods. Rank Column: Lastly, mousing over the rank column will show me the value the stock has for each criterion. I’m going to scroll through each stock that passed this screener and pass a quick judgment on it looking at all of these factors. It’s a lot of information, but keeping to strict objective standards makes the “yea or nay” evaluation of each stock goes pretty quickly. In the first pass, we’re going to try and get a sense of the strength of the underlying business, so we’ll be looking heavily at the Sales, EPS, and Operating Income numbers both in the chart and the Insight panel. Revisions to the estimates are generally delayed—analysts don’t just revise downward at the first sign of trouble, so if they do revise downwards it probably means there is substantial evidence for doing so. Some revisions downward are only by a few cents, whereas others are drastic downward readjustments—this underscores the importance of looking at the actual magnitude of the revision, as not all negative revisions are equal. A one-time revision downwards could be due to some one-time bad news—and the stock may have adjusted and be fine from here on out. This is not as troubling as continual revisions downward in every period (90 days ago, 60 days ago, 30 days ago, and 7 days ago) so it’s important to see the progression of estimates. If it’s gone down in every period, who’s to say it won’t continue to do so? Related to #3, generally a revision begets more revisions, so if we see a pattern of continuous downward revisions then that may be a sign that there are more to come. If a stock doesn’t pass a test, I could just remove it from the watchlist and be done with it. But, for the sake of documentation, I’m going to instead tag it with a keyword explaining why it was removed from consideration, and then move it to a different watchlist that will keep track of all the ones that didn’t pass my tests. First, we’ll take a look AFSI, at the number one passing stock. When I mouseover its rank (below), I see that it’s got strong numbers across the board, with a breakneck rate of dividend growth, but also very strong growth rates in EPS, Operating Income, and Sales, all the while maintaining a low payout ratio. If I move my mouse one column over to the “EPS Next Year Estimate Trends”, I can see that there was an initial adjustment to next year’s EPS estimates by a few cents, but then in the past seven days the estimate has been revised upward by 20 cents, which is a good sign. This looks good, so let’s move to the chart. We can see that AFSI has outperformed its industry and sector by a large amount of the past five years, though with some volatility. In the secondary chart its Sales, EPS, and Operating Income have been marching upwards together, another good sign. Over in the Insight panel, we can see that its Sales have been strong and overall consistent across the 1-, 3-, and 5-year periods and have outstripped its industry’s numbers by a huge amount. Its growth in Operating Income has been strong, with a spike over the 3-year period, but that’s consistent with its industry as well. EPS has had accelerating growth that’s above the industry average, which is great. Actually, it’s outperformed it industry and the S&P 500 in all periods, by a lot in most cases. While the volatility that we saw in the Chart could give cause for concern, all of its numbers are strong enough to for me to let this stock through on to the next round of testing. Overall its numbers look pretty good—it’s got accelerating dividend growth, extremely high growth in both EPS and Operating Income (though not in Sales—first red flag), and a decently low Payout ratio. But, when we move over to the EPS Next Year estimates, we see some troubling signs already. The analysts have downgraded their Next Year EPS estimate in every time period. Since 90 days ago, the estimate has gone from $4.79 to $4.44, or down by -7.3%. Depending on how ruthless you’re feeling, you could even bail at this point, but let’s keep going. In the chart we see that LECO (dark blue line) broke away from its industry (light blue line) about two years ago, but since then has hit some serious volatility and stagnation in the past year and is generally trending sideways or downwards. In the secondary chart, Sales, EPS, and Operating Income have all crested and have been decreasing each quarter in the past half year or so—another troubling sign . Over in the Insight panel, we see that its growth numbers are all headed downwards. Its Sales, Operating Income, and EPS have all contracted in the past year. None of this bodes well, so we’ll color this stock red to flag it and tag it with “slowing 5-year growth” to remember why we cut it out in the first place. The next step would be to do this for all the stocks that pass—looking at the areas mentioned above and flagging any stocks that we don’t want to advance. I’ve created a video where I go through a couple more of the stocks so you can get a better feel for how quickly it would go. 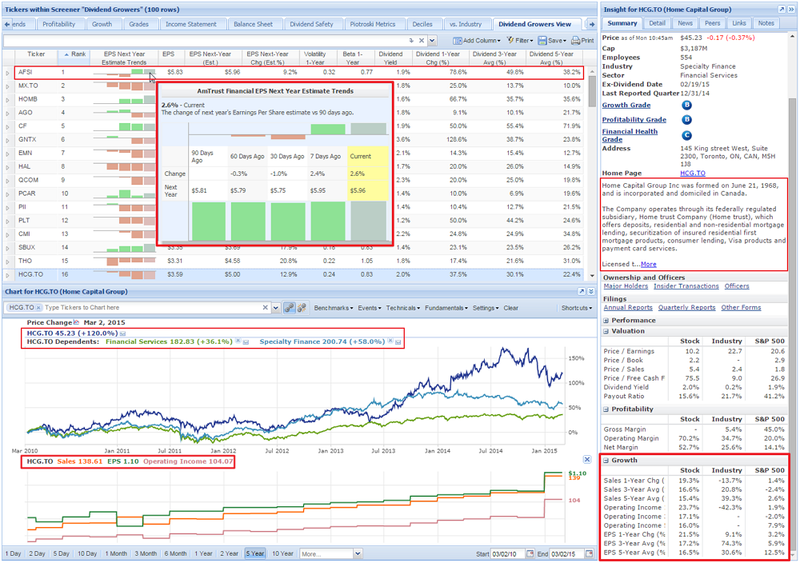 To look at Margins, I’ll chart the “Margins” metric package, as well as keep an eye on the “Profitability” section in the Insight panel’s summary tab. (For stocks in the Financial Services sector that don’t have a Gross Margin, I’ve created a second metric package with just the net margin and the operating margin.) From here, we can run a similar process as before—step through each stock in the list and flag it if its margins are falling. I’ll use Boeing (BA) as an example. 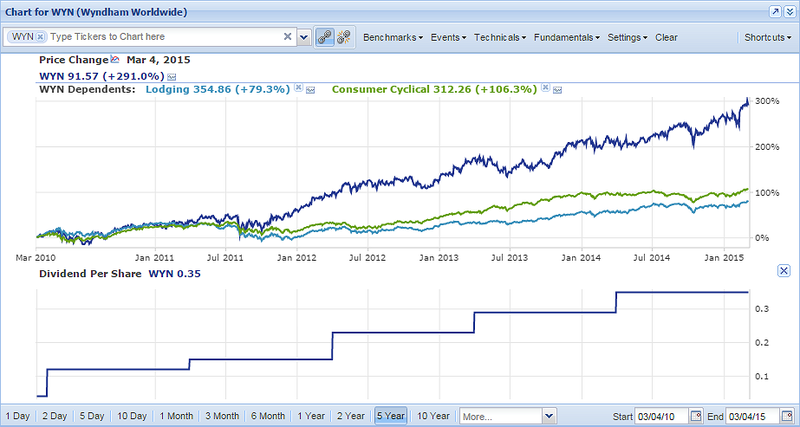 Below we can see its 5-year Gross, Net, and Operating Margins. You can see that over the past five years, BA’s margins have been coming down ever so slightly. If you go over to the Profitability section of the Insight panel’s Summary tab, you can compare those margins against those of BA’s industry, and see that its gross margin is already below that of its industry by 3.9 percentage points. Its operating margin is generally on par with its industry, and the net margin is slightly better. Let’s also take a look at the Return on Invested Capital (ROIC), Return on Assets (ROA), and Return on Equity (ROE) with the Efficiency metric package. Though there has been an uptick in the six months, these have also come down considerably over the past five years. These two charts combined means that I’m going to flag BA yellow (meaning it passed the first round but not the second) and tag it as “decreasing efficiency” and take it out of the running. After running the same process on the remaining stocks, I’ve removed: AET, AFSI, and RGA for decreasing margins, and ALTR, CLC, HCG.TO, and OZRK for decreasing efficiency. We’re now down to 38 stocks. In the previous sections, we’ve mainly focused on the fundamentals in the secondary chart, but now we’re going to take a closer look at the price performance in the past five years in the main chart, as with the industry and sector added in as benchmarks. Once again, we’re going to step through each stock quickly and decide whether its price chart look troubling. I want to show HOMB’s chart, because it has a good example of a falling wedge, which is a pattern used by technical analysts to identify bearish sentiment. Now that it’s out of the wedge, it is still trending sideways in what looks to be a bounded pattern. When we go through all of the stocks with an eye on price performance, the following eight don’t make the cut: B, HOMB, IBN, PCAR, TROW, WCN, HNP, and NJR. They’ve been flagged blue and tagged “poor price performance,” and then moved to my “Discarded” watchlist. First we’ll look at the Payout Ratio. Once again, I’ll show an example so you can see how I’m going through this process. Below I’ve charted AOS with its Payout Ratio in the secondary chart. You can see that the payout ratio has crept up a little in the past few years, meaning that the dividends are taking up more of the earnings. However, if you zoom out to ten years, you’ll see that actually the Payout Ratio is right on part with historical averages (excluding the crisis). Also, if you look to the right in the Insight panel under the Valuation section, you’ll see that the payout ratio for this stock is well below its industry. 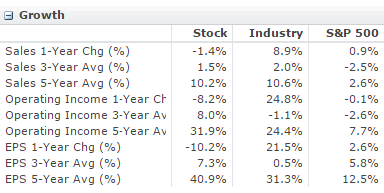 None of this looks troubling, so we can move on and look at the Payout Ratio for the rest of the remaining stocks. When we run this on the whole set of stocks, we find that ITC, JKHY, TTC, and UNH are increasing their Payout Ratios. While this attribute alone is not enough to cut them out of the running, I have tagged and flagged them light orange in order to keep track. Next, we’ll make sure that this company has ample cash to cover its dividend payments, and for that we’ll look at the dividend coverage ratio, and the quick ratio. The dividend coverage ratio is the number of times over that the firm could pay its dividends with the cash that it has. Generally it should be above 2 or so, and not decreasing unless it has a large cushion below it. The Quick Ratio looks at a company’s ability to meet its short-term obligations with its most liquid assets, and it should also not be decreasing. By this point we’ve done several tests to make sure that these companies are financially sound, so it’s unlikely that there would be an issue with the cash, but we’ll take a peak anyway. I like to look at these ratios together, so that if a stock has a low quick ratio, but a high dividend coverage ratio, then I’m not going to be concerned; I’ll only get worried if they are both low and falling. I’ve added these to the chart through a metric package (note that the Cash Dividend Coverage Ratio is in the Library under Custom Metrics and available to Premium users only). For this example, I’ll show AOS. While the values bounce around a bit, both are solidly positive and don’t have a discernible downward trend, so that’s good news—no need to flag this stock. We also want to make sure that the company isn’t taking on a lot of debt, which can add risk for the long term and divert cash from dividends to interest payments. To evaluate debt, we’ll look at the Debt/Equity and the interest coverage ratio in the chart. I also like to push the chart back to ten years to get more of a sense in the pattern of the debt. We’ll use AOS as our example, starting with Debt/Equity. You can see that the Debt/Equity has decreased over time. This looks like a company that prioritizes reducing its debt load, which is a good sign. Let’s also look at the interest coverage in the same period. The interest coverage is also going up, meaning that the firm has an increasing cushion for its interest payments. All in all, these two metrics point to a healthy balance sheet for this company, which bodes well for the dividend’s security. Before going further, I want to point out that we’re in a bit of unusual environment for debt. Because the interest rates have been so low for so long, it may be the case that companies chose to take on more debt, and then bought back stock with the extra cash. This scenario adds some nuance to how we must interpret debt. Rising debt should only cause for concern if it’s accompanied by rising share counts or the weakening of other key fundamentals. 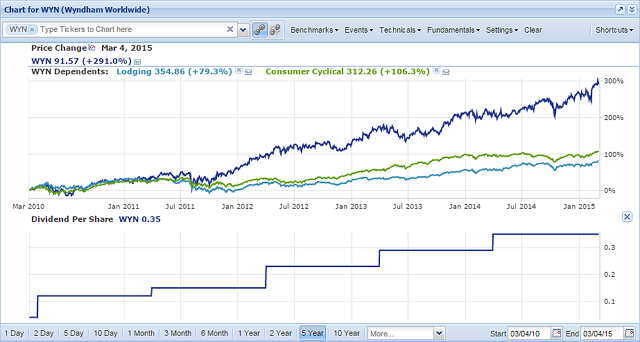 Kroger (KR) has a very high Debt/Equity—over 2. A historical perspective shows that they’ve always had an elevated ratio, but even so it makes me nervous. But, their interest coverage has held steady at about 5, meaning the interest payments don’t seem to pose a threat to their cash, and their share counts have been coming down consistently over the last five years. I’ll keep it in my list, but will take a hard look at its financials later on. ITC Holdings (ITC) has been steadily increasing its debt and Debt/Equity, which, at 2.5, is already way above industry’s average of 1.1. Additionally, its share counts are headed up, not down, which means they are diluting a stock. The interest coverage has also been dropping, and taken together these signs are flashing red. I’ll remove ITC from consideration. L Brands (LB), which already had one strike from the coverage ratio, has negative equity, increasing debt, and has been increasing their share count in the last two years. I’ll also remove this stock from consideration. Lenox International (LII) has also been increasing its debt, and it had an enormous jump in Debt/Equity recently. Its interest coverage data is spotty, but overall it looks a bit uneven and I’ll remove it from consideration. MCO is increasing its debt, but also reducing its shares. Service Corp International (SCI) has been increasing its debt, but it’s also increasing its interest coverage and reducing its share count. Valspar (VAL) has increased its Debt/Equity over the past five years, but on closer inspection it’s not because of a rise in debt but rather a fall in equity. But its share count has come down, and its interest coverage has remained steady, so we’ll keep it the table. Wyndham Worldwide (WYN) has a very high Debt/Equity of 4 that’s been steadily climbing over the past five years. While its share count has also been falling, its interest coverage has stayed steady around 5. For me the debt is too high and I’ll remove this stock from consideration. 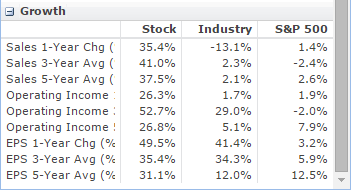 Now, we want to do a final scan of the dividend history for all stocks that are still standing. For this test we’ll just take a look the history of dividends over the past five years. Now, this test is slightly redundant, because our original screener selected for strong dividend growers anyway, but we do want to double-check to make sure that there haven’t been any dividend reductions or interruptions. After setting up the chart in the following manner, and doing a run through of all the stocks, they all look good. We’ve narrowed our original 100 stocks down to 26. For that full watchlist, you can head to the Library. If, at the end of this post, you’re thinking that this all seemed like a bit too much work to get to these final 26, you can always take the screener we used and modify it to your liking. For example, you could use screener equations to automatically filter out stocks whose sales growth is slowing, or whose share count is rising. In our next post, we’ll take a closer look at these 26 stocks to find the ones that will be the final stocks to make it to our portfolio.